Hello guys! It's taking its time but I am finally getting into the swing of handling both life, work and blogging again. I was recently contacted by *Karma Se7en a body jewellery brand, who sell a number of a real and also fake jewellery pieces. Considering the piercings I only have are my ears (I had them both stretched to a size 10 plug size but let them heal up) I thought it was such a cool idea to go for the fake body jewellery to see what I could potentially look like with other piercings. For a number of years now I have been contemplating getting my septum pierced, but I have yet to actually see if I would suit the piercing. Karma Se7en's *Faux Septum Clickers section straight away caught my eye because of the many beautiful options they have, all being individual and very feminine. 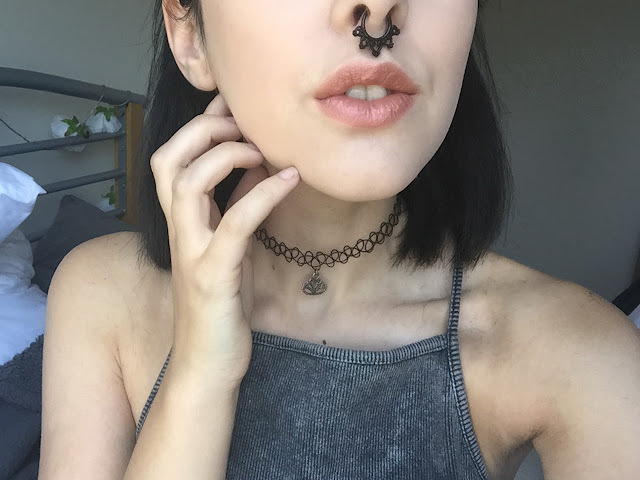 I know you would start with a plain piercing if I was to get it finally done, but I really want to jump onto the 'fancy septum piercing' wagon. I was sent the *Black Bliss Fake Septum and I already feel like it was made for me, it fits into my nose so easily and doesn't bother me as much as I thought it would. It sits so good just under my nose and isn't too low, which were thoughts I always contemplated looking at such fancy pieces of jewellery. I don't fiddle with it at all! Another aspect of *Karma Se7en that I like is the packaging, which is definitely unique but professionally boxed. It was a pleasant surprise to open up my package to find these neat little boxes, the jewellery pieces themselves coming in cases to which I can store them away in my jewellery box without them getting mixed in with everything else. 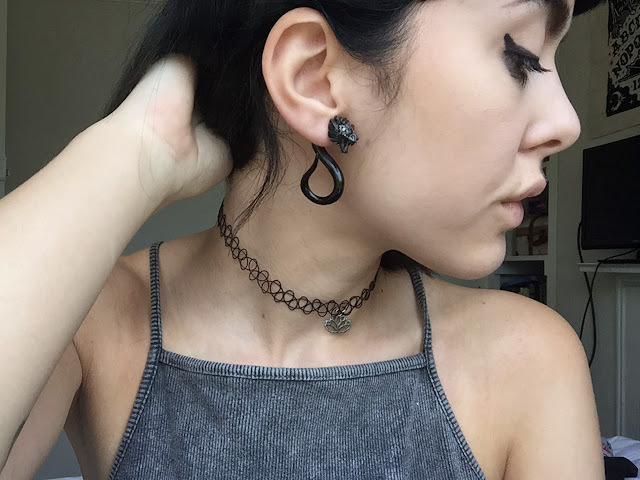 The second piece I was sent was this *Carved Horn Dragon Twist fake ear stretcher jewellery! Considering I once upon a time had both my ears stretched to atleast a ten 10 mm, I love this! I had never really been interested in the type of stretcher jewellery that hung down, but seeing just how unique they can be makes me wish I had kept my ears stretched. Yes it was a painful experience at times, but just to have something as beautiful as this piece? worth it. The fake piercing works just like an earring, you take off the head of the dragon and but the sharp part through your ear and connect the back, so that from both sides it looks to be a stretched ear piercing. Another section of the website I found to be interesting is definitely the Buy one choose one free offer, which I know everyone who likes a deal will love. http://www.karmase7en.com/buy-one-choose-one-free/ , which if you click this link will show you how to receive this deal. I hope you all liked this little body jewellery review/haul and definitely check out *Karma Se7en if you too, like me want to see what you will look like with other piercings before going out and getting them done! I am seriously contemplating getting my septum done, but finding this website means I can wear a fake one and still have the same look. Jewellery Haul | Black Moon Shop Jewellery!